He uses processes in which he himself has no influence on the eventual appearance of the work. A characteristic for Hiorns' working method is the combination of two basic elements, which are simultaneously opposite and supplementing each other: ceramic pots with moving foam, metal with fire, a car engine with growing crystals, steel with perfume, even glass fiber with brain matter. The relation between the movable and the immovable, the living and the dead yields an undeniable tension in his work. Like a modern-day alchemist Hiorns transforms the objects and materials to give them a new function and meaning. 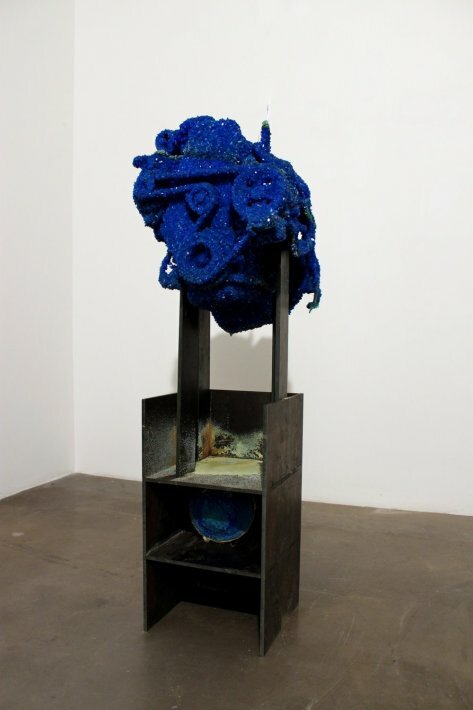 Roger Hiorns studied at Goldsmiths College in London. Some of solo exhibitions include Ikon Gallery, Birmingham (2017), Annet Gelink Gallery, Amsterdam (2016), Rudolfinum Gallery, Prague (2015), Corvi-Mora, London, (2015), Corvi-Mora, London, (2015), Luhring Augustine, New York (2014), The Hepworth Wakefield, Wakefield, (2013), MIMA, Middlesbrough (2012), Aspen Art Museum, Aspen (2010), The Art Institute of Chicago, Chicago (2010), the Tate Britain, London (2010), the Camden Arts Centre, London (2007) and the UCLA Hammer Museum, Los Angeles (2003).